We know that supermassive black holes exist in the center of most galaxies, and they can become quite massive (upwards of billions of solar masses). What we aren’t sure about is just how they come to be. One idea is that these supermassive black holes began as black hole remnants of very large first generation stars (known as population III stars). These stars would consist only of hydrogen and helium, and would likely have been as large as 1,000 solar masses or more. Because of their large size they would burn their fuel very quickly and die as a hypernova, with its core collapsing into a massive black hole. Such black holes would then form the seeds of modern supermassive black holes. Another idea is that early proto-stars could be so massive that they form something known as a quasi-star. (This should not be confused with a quasar or quasi-stellar object, which are intense radio sources we now know are powered by supermassive black holes). 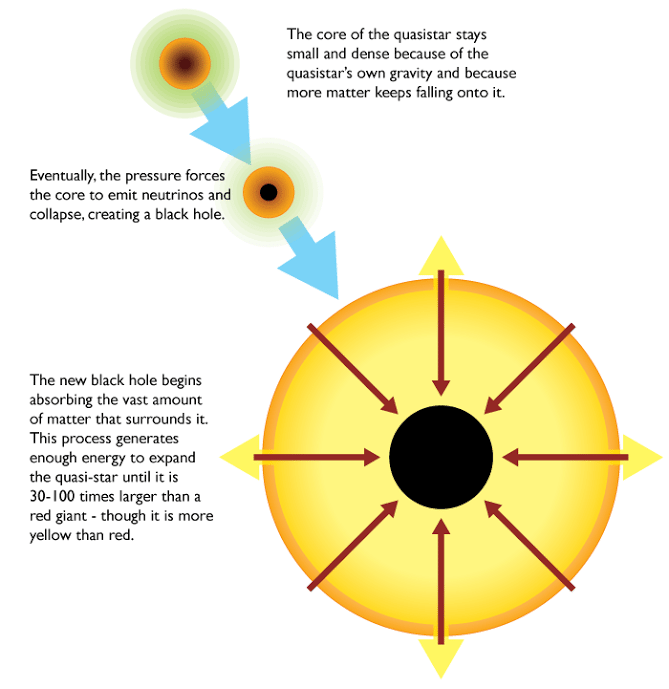 A quasi-star is an object that resembles a star, but instead of being powered by nuclear fusion in its core a quasi-star is powered by a black hole in its core. Basically the idea is that a supermassive proto-star begins to collapse into a star, but its central region is so massive that a black hole forms. The further accretion of matter into the black hole release a significant amount of heat, which then acts similar to the way nuclear fusion powers a normal star. Normally the formation of a black hole would release so much energy that the outer layers of the star would be driven away, simply leaving a black hole, but in this case the quasi-star is so massive that that doesn’t happen. If such an object were possible, it would provide a way to create very massive black holes fairly quickly in the early universe. Just to be clear, quasi-stars are purely hypothetical. But a recent paper in Astronomy and Astrophysics looked at quasi-stars as a possible progenitor of supermassive black holes. The authors examined the conditions necessary for a quasi-star to form. As a cloud of gas begins to contract into a star (known as a protostar) it heats up due to a process known as the Kelvin-Helmholtz mechanism. If you’ve ever squeezed clay or a rubber ball in your hand and noticed how it warms up, you get the basic idea. As gravity squeezes the gas, the gas rises in temperature. This means that the pressure rises as well, which increases the chance for nuclear fusion. In order for a quasi-star to form, the protostar must be quite massive, and it must collapse relatively quickly. 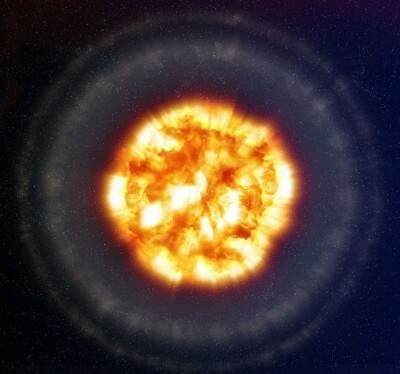 If it has time to form stable nuclear fusion in the core, then it is likely that a supermassive star would form, which would push off the the outer layers of gas and limit the size of the star. Even if a black hole formed in the core, it would need to consume matter at a sufficient rate to produce enough heat to maintain a quasi-star. If it doesn’t maintain that heat, then the protostar could start to collapse too quickly, causing it to overheat and drive off the outer layers, thus leaving a more normal sized black hole. What the authors demonstrated was that a quasi-star could form if the central region is dense enough to form a central black hole, and if that black hole absorbs at least 0.14 solar masses per year. Doing some basic calculations, this would be possible if you had a protostar mass of about a million solar masses. The resulting quasi-star would last about 7 million years, after which you would have a supermassive black hole. So the existence of quasi-stars in the early universe would provide a way to create supermassive black holes on very short cosmological time scales. But the authors also note a bit of bad news. Large protostars would likely form within dark matter halos in the early universe, but observational evidence indicates that such dark matter halos likely wouldn’t have a million solar masses worth of matter. This means it is much more likely that supermassive stars formed instead of quasi-stars.